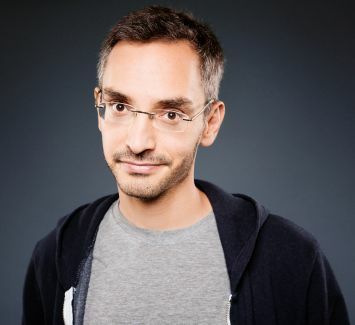 Myq Kaplan (pronounced “Mike”) is a comedian. His smart, whip-around style of comedy has landed him appearances on The Tonight Show with Conan O’Brien, The Late Show with David Letterman and a Comedy Central half hour special. You may also have seen him on NBC’s Last Comic Standing and America’s Got Talent. Myq’s debut CD Vegan Mind Meld was one of iTunes’ top ten best selling comedy albums of 2010, followed by 2013’s Meat Robot. His one-hour special Small, Dork and Handsome was released in 2014 on Netflix.